Newtown AFC concede their 2nd straight defeat in the Welsh Premier League after a 5-0 defeat at Park Hall on Friday night. 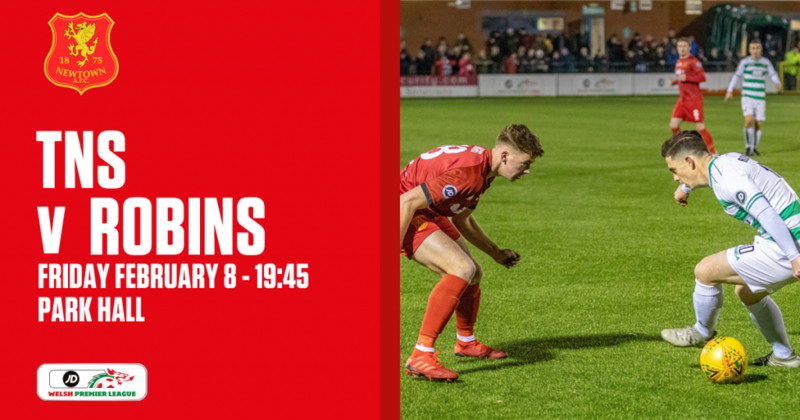 First half goals from the Saints’ Ryan Brobbel, Jack Bodenham and second half goals from Jamie Mullan and Greg Draper (x2) made it a wet and windy night to forget for the Robins. 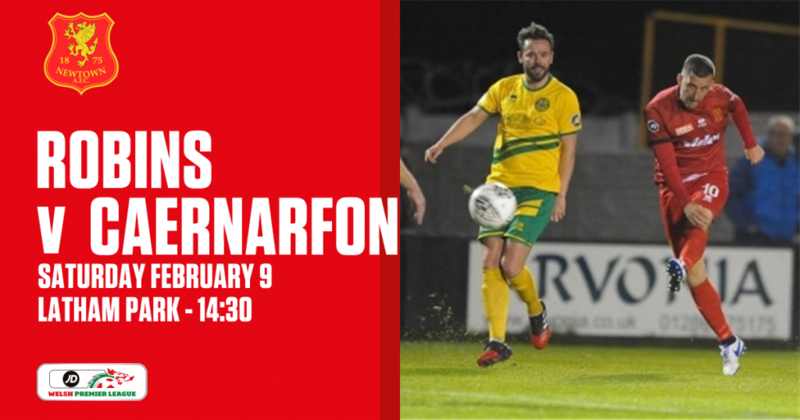 The defeat keeps Newtown one point behind Caernarfon Town in 5th place in the Welsh Premier League table after Caernarfon were beaten 6-2 at Connah’s Quay Nomads on Friday night. Newtown’s goalkeeper Dave Jones was not match fit to start the game after picking up an injury in our previous match against Connah’s Quay Nomads – 21 year old Jack Perry took over in between the sticks. 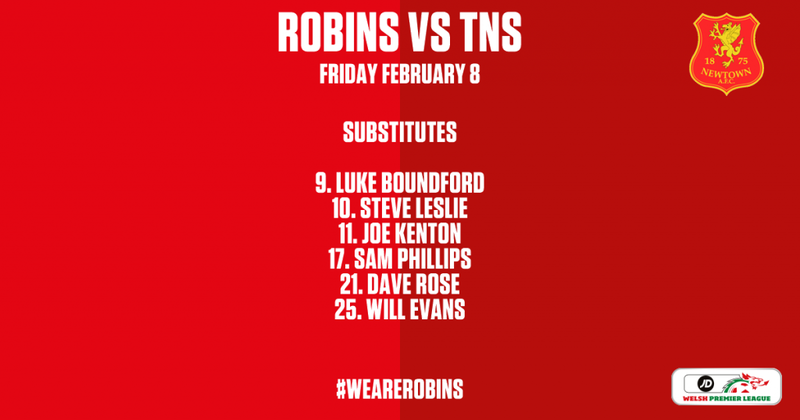 Kieran Mills-Evans returned to the starting line-up after serving a one match suspension which was served in the 1-2 defeat to the Nomads. Nick Rushton got the game underway for kick-off and just two minutes our forward created the first chance of the evening as Rushton picked up a scary ball for the TNS defence but his attempt went out for a goal kick. When the match reached the first ten minutes of the game, Rushton was at the forefront once more as he lifted the ball in the air but the shot unfortunately didn’t come down for the target. But then the hosts turned on their engine and opened the scoring five minutes later after Ryan Brobbel dispossessed the ball before bringing the ball into the Newtown box and then smashed the ball into the roof of the net. 11 minutes after TNS opened the scoring, there was a dangerous moment for the Newtown backline when a dangerous arrived into the penalty area from the wing which nearly picks out Jamie Mullan from close range. The scoreline remained at 1-0. Young Perry made sure Newtown were just one goal behind on the 32nd minute when he created a fine save which denied Daniel Redmond’s 30 yard effort. 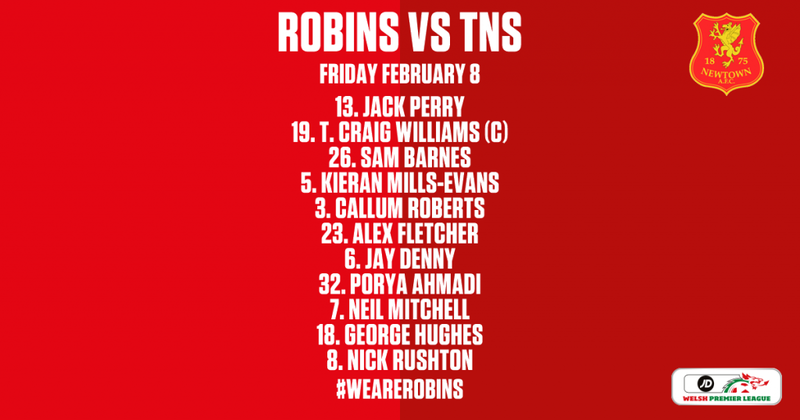 The Robins were not showing much presence up front since the opening few minutes but then a free kick arrived with less than five minutes before the half time break. Skipper Craig Williams delivered the free kick into the TNS box but was not picked up by any fellow Robins players, only for the ball to roll out of play. 1 minute was added at the end of the first half and just like our last visit to Park Hall a few weeks back, the hosts scored again moments before the interval. Last time it was Jamie Mullan, this time it was Jack Bodenham who scored from tapping home a free kick delivery – catching Newtown’s defence asleep. Just four minutes into the second half and TNS found themselves 3-0 up as Mullan finishes with a volley from close range to potentially putting the game to bed – Ryan Brobbel with the assist. Perry had another fine moment in between the sticks when making a save moments before Kurtis Byrne strikes at goal but Williams creates an heroic piece of defending by blocking the shot on the goal line. 15 minutes from time and substitute Greg Draper made it 4-0 to TNS when he slotted the ball past Perry after going one on one with the keeper. Draper then went joint top of the Welsh Premier League goal scorer list for this season by claiming his 17th goal of the league campaign when finding the Saints’ 5th goal of the night on the 90th minute. 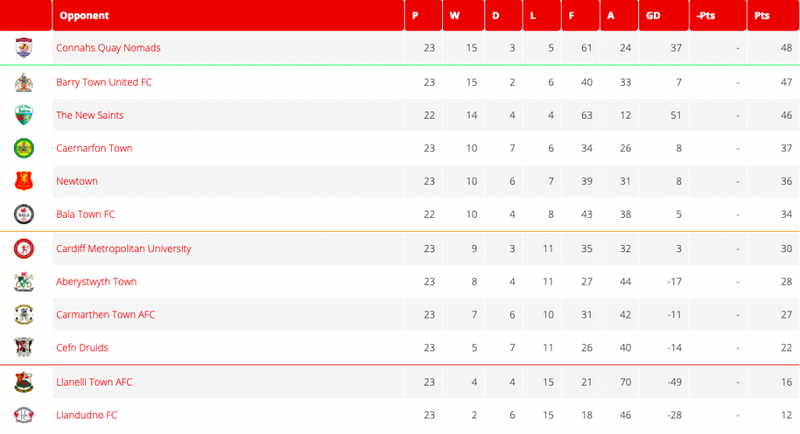 It proved to be a wet, windy and miserable night for Chris Hughes’ men as the 2nd consecutive defeat in the league keeps them 5th place in the top 6 division. The New Saints: 1. Paul Harrison (GK) (C); 2. Simon Spender, 3. Chris Marriott (11. Adrian Cieslewicz 45′), 5. Jack Bodenham, 12. Blaine Hudson, 4. Tom Holland, 6. Jon Routledge, 14. Jamie Mullan (32. Billy Whitehouse 64′), 10. Daniel Redmond, 8. Ryan Brobbel, 21. Kurtis Byrne (9. Greg Draper 66′). Substitutes: 30. Lewis Dutton, 17. Dean Ebbe, 9. Greg Draper, 22. Kane Lewis, 11. Adrian Cieslewicz, 32. Billy Whitehouse. Newtown AFC: 13. Jack Perry (GK); 19. T. Craig Williams (C), 26. Sam Barnes, 5. Kieran Mills-Evans, 3. Callum Roberts, 23. Alex Fletcher (17. Sam Phillips 70′), 6. Jay Denny, 32. Porya Ahmadi, 7. Neil Mitchell, 18. George Hughes, 8. Nick Rushton (9. Luke Boundford 63′). Substitutes: 9. Luke Boundford, 10. Steve Leslie, 11. Joe Kenton, 17. Sam Phillips, 21. Dave Rose, 25. Will Evans. Listen to Newtown AFC manager Chris Hughes’ post-match interview after a 5-0 defeat away to The New Saints on Friday night. Note: Updated after Friday night’s matches.